1 What Exactly Is Surf Fishing? What could be better than a day on the beach? Of course, doing a little surf fishing! Also known as ocean shore fishing, surf fishing is a great way to spend time with the whole family, or spend an exciting day by yourself catching fish. Sunset surf fishing is one of my favorites. The colors of the sky can be breathtaking. You don’t have to be an expert angler to have a successful surf fishing experience. With the tips from this article, you will have the knowledge you need to go out and catch a BIG ONE! 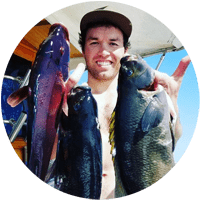 If you are already an experienced surf fisherman, then hopefully you’ll find something new here. 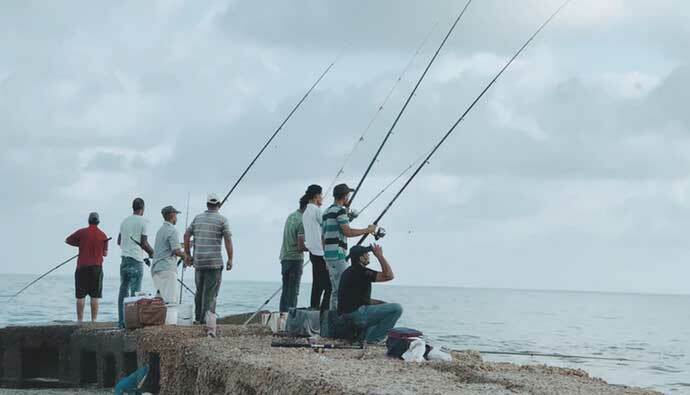 What Exactly Is Surf Fishing? 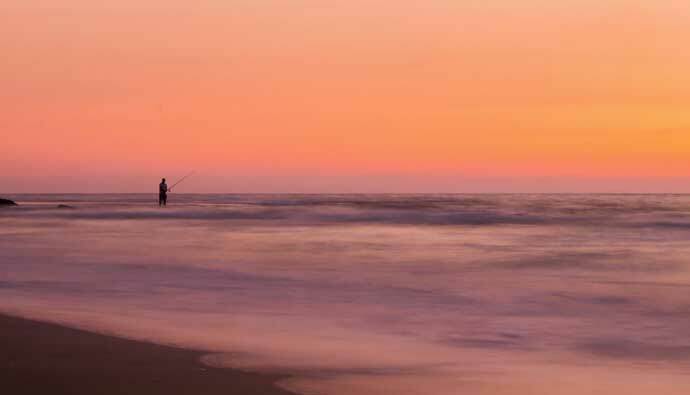 Surf fishing is the sport of catching fish standing on the shoreline or wading in the surf. The terms surf casting or beach casting refer more specifically to surf fishing from the beach by casting into the surf at or near the shoreline. For surf casting, rods are much longer than standard fishing rods. They can measure as long as 15 feet or more. The reason for the extra length is to give leverage when casting. This is because the main objective when surf fishing is to cast as far as possible. This gives you a better chance of catching larger fish. Surf fishing differs quite a bit from pier fishing. The surf fishing rods are much much longer, and the casting distance is much farther. In many cases with pier fishing, you are simply dropping your bait into the water, or casting shorter distances. Surfcasting rigs also differ from standard saltwater fishing rigs. They can have multiple lines and are more weighted. It’s great to see how people surf fish around the world. At some beaches, anglers report better fishing as the day wears on. Another popular time to fish is at dusk when the water begins to cool and fish come off the bottom to hunt for food. Tide can also be a factor at midday. Watch the ebb and flow of currents. Fish are often in the trough between the beach and sandbars or a reef, but they flow out through gaps. You can see the outward flow on the surface. It is productive to position yourself to fish the outflow. Another factor in surf fishing is in many cases you are fishing against more swift moving water. A steady, progressively faster cast with a release at 1 o’clock will give you the most distance. This can take some getting used to. Because of the fact you will be wading out from the shore, there are undercurrents that can be quite strong. These currents can be strong even for the most experienced angler or swimmer. It is crucial to be aware of the currents in the area you are fishing. The last thing you want is to be swept out to see or lose your gear in the surf! Rocks, coral or shells below the surf, are just a few examples of debris that can be hidden under water. Jellyfish, as well as other biting/stinging ocean life, can be a huge problem for a barefoot angler. Sandals or crocs are a good idea before entering the water. Some fishermen even elect to wear hip waders. Even if the shoreline looks clean, there may be items washed up just out of sight, from miles away. As much as you may like to feel the sand between your toes, it is not a good idea. You may get more than you bargained for. Depending on the state you are fishing in and the beach you are on permits and license requirements can differ. A good example is the Florida Atlantic Coast. You need a free resident shoreline license, which can be obtained online from the Florida Fish and Wildlife Commission. Nonresidents must purchase a 3 day, 7 days, or annual non-resident saltwater fishing license. This is when saltwater fishing from the shore or a pier, bridge or jetty attached to the shore unless fishing on a pier with a pier license. The shoreline license does not apply when fishing offshore from a boat. Free means that you pay nothing for the license, but you may have to pay a service fee. Note: No license is needed if you are under 16 or over 65 with an ID showing proof of age. It is a good idea to check with the Fish and Wildlife Commission in the area you will be fishing to see what they require. Check out our in-depth surf fishing gear guide here. Rod holders keep your rod and reels out of the sand. You can buy them, but it’s easy to make them yourself out of a three-foot length of PVC pipe. Use a hacksaw to cut a point at one end for driving into the sand. Pack a rubber mallet to pound it into the sand. A PVC-framed cart for carrying gear can be a good idea depending on the amount of gear you are carrying. You can purchase these handmade carts at many beach-area bait and tackle shops for $150-$200, or you can build one yourself to meet your specific needs. The key to building a successful cart is the beach wheel, which needs to be wide and rolls freely. Bait knife, pliers, gloves and nail clippers. You need pliers to remove hooks from your fish without hurting the fish, and nail clippers are indispensable. Gloves are useful for holding your catch and protecting your hands from sharp teeth and fins. Special casting gloves without fingertips can be purchased. They can be mesh fishing gloves, but throwaway vinyl gloves do the least damage to your fish. Nets can be a big help. As you reel your catch to shore, fish bounce in the surf and get thrown off your hook. Monofilament line is the choice of most surf anglers, but old-school fishers used braided lines. Today’s braided lines are far more superior. They are thinner and stronger. Approximately 150 yards of 30-lb braided line with a monofilament backing of another 200 yards is recommended. This allows room for the fish to run and wear itself out. Another choice is monofilament, 15-lb. and 25-lb. test. Pyramid sinkers because of their shape creep into the sand and hold your bait near the bottom. They come in various sizes, and it is a good idea to bring a selection for varying surf conditions. Some have wire anchors, although they can be troublesome. Egg sinkers and bucktail jigs work as well. A little bounce on the bottom stirs up the sand, attracting fish. In a calm surf, let your bait swim on a line unencumbered by a weight. The basic rig for most saltwater fishing is called the Fishfinder, or sliding rig. Slip the tag end of your line through the eye of your sinker, then attach a swivel big enough to stop the slide. On the other end of the swivel, attach a 30 lb leader with your hook. Add bait and cast as far as you can. You don’t always have to be waist deep in the water to fish the surf. The pompano rig has two or three sub-leaders, spaced and tied off on the main leader, with small circle hooks. Clip a pyramid sinker to a swivel at the bottom of the rig. Simple to use and effective in the surf, especially for pompano. Fishfinder rigs, high low rigs, and fireball rigs also work very well. They take some practice making. Other than jigs, lures are not always effective in the surf, except when fish are running. You might try an artificial lure, but live bait is always best and bait shops usually have plenty of live bait. At other times, try a live shrimp on a jig, then bounce it on the bottom a few times in the surf. The jig of choice for surf fishing is the feathered bucktail jig tipped with a small piece of shrimp. They are a small crab. Some people call them Sand Crabs. Premium bait for a pompano, a delicious white-flesh fish and prime game in Florida’s Atlantic coastal waters. Also known as a mole crab, you can either buy them at a beach area bait shop or pick them out of the sand along the surf line. As the surf rolls back, watch for tiny disruptions in the outward flow, showing as a V. Those are antennae. Scoop the sand around the crab and dig them out. Live is best, but frozen works in a pinch, just not as well. With live shrimp, you need a bucket and an aerator to keep them alive for a day of fishing. The aerators run on batteries and attach to your bucket. Add seawater, drop the tube with an aerator head into the water to continually adding oxygen. Without an aerator, the shrimp will not live long. Decide ahead of time whether you plan to release your catch. When you land the fish, pick it up carefully but firmly and remove the hook. Wet your hands first so that you don’t remove the slime that protects the fish. Once the hook is removed, carry it into the surf and gently release it in the water. It is not a good idea to “throw it back”. Throwing the fish into the ocean can injure it resulting in it dying. Watch out for barbs, teeth and sharp fins. If the fish does not move, give it a nudge so the water will flow through its gills. Hold it under the water, supporting its belly with your hand. Nudge it back and forth until it gets its strength back. Once you master the art of surfcasting, you are well on your way to being a seasoned surf fisherman. Surf fishing can yield some good fishings. It is not unusual to catch sharks, large flounder, and not to mention redfish. The type and size of fish you catch will differ depending on where you are fishing. But one thing is for certain, they are always there. Larger fish routinely patrol shorelines in search of an easy meal. These easy meals are usually schools of baitfish that congregate close to the shore. That is one of the main reasons live bait is so productive. Q: Best time to surf fish? A: Tide can also be a factor at midday. Watch the ebb and flow of currents. Fish are often trapped in the trough between the beach and sandbars or a reef, but they flow out through gaps. Q: What is surf fishing? A: Surf fishing is the sport of catching fish standing on the shoreline or wading in the surf. The terms surf casting or beach casting refer more specifically to surf fishing from the beach by casting into the surf at or near the shoreline. Q: Best bait for surf fishing? A: Live baits such as sand fleas, shrimp, and cut baits. Q: Best surf fishing rod and reel? A: Penn Spinfisher V 6500 Surf Rod and Reel Combo have had some of the best reviews. Q: How to rig for surf fishing? Choose a surf rod that will be able to cast over the rolling surf. Surf rods are like any other rod but are much longer. They usually come in sizes from 10 to 14 feet. Make sure to choose a rod that you will be able to handle and is not too big for you. As long as you are able to cast over the breaking surf and get into the calmer waters, you will be able to catch fish. Select a medium-weight line to use on your pole. Usually a 10- or 12-lb. test will do the trick. These are medium-weight, all-purpose line strengths that will hold up in a variety of situations, including fishing in the surf. Use a triangle sinker on the end of your line. The rougher the water conditions, the heavier sinker you will need. If conditions are basically normal, a 3-oz. triangle sinker should work fine. If you use a sinker that’s too lightweight, it will not hold ground and will be pulled back into shore. Tie two to three hooks spaced about 3 inches apart, approximately 8 inches above the sinker. The more hooks you tie on your line, the more bait you will be able to rig the line with. This will give you more chances of catching a fish. Use bait that will attract fish in the surf. Shrimp, clams, sand fleas, live fish, cut-up fish, and squid are a few of the selections you have. You should be able to find any of these baits at a local bait store. 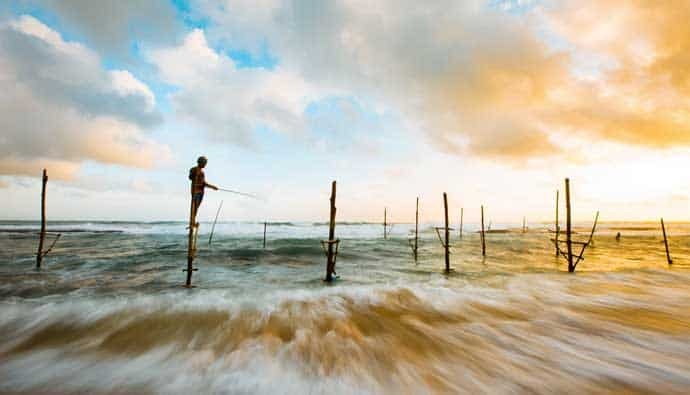 If unsure of what will work best, ask the locals what they use to catch fish in the surf.